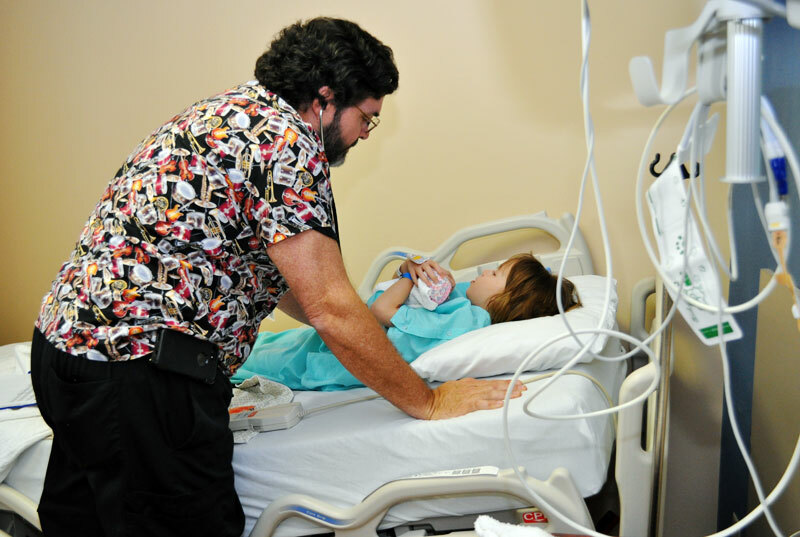 Pediatric hospitalist Mike McCabe cares for 7-year-old Cammi of Canton at Aultman for a middle ear infection. Dr. Mike McCabe never had that “aha” moment in his youth some people experience when describing what led them to their life’s work. If you ask him, he’ll tell you his path to becoming a doctor was a journey. If you had the chance to have Dr. McCabe treat your child, it would quickly become apparent that the privilege was yours. A veteran pediatrician who ran a successful practice for 19 years, Dr. McCabe accepted a position as a pediatric hospitalist at Aultman Hospital in 2006 because he was ready for an opportunity to do something different. Along with his partners Drs. Tim Kilkenny and Sarah deCamps, he provides 24-hour coverage to the pediatric unit at Aultman. All 3 are employed by Akron Children’s Hospital. 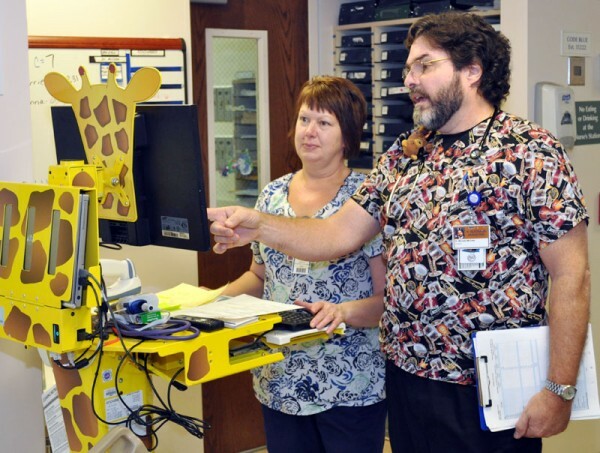 A unique partnership between Children’s and Aultman offers families in the Stark County area access to the expert care they have come to expect at the Akron hospital – only closer to home. Cammi, age 7, was admitted to the Akron Children’s at Aultman inpatient unit to rule out Kawasaki disease. Dr. McCabe is pleased to keep her close to home for care. “It works well because we have long been established in the Canton community and have good rapport with local pediatricians and family practice docs who refer patients to the unit,” said Dr. McCabe. 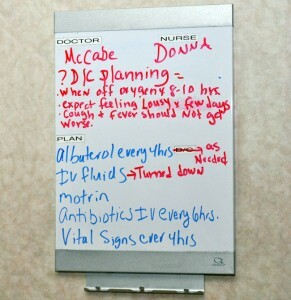 This week Dr. McCabe is working 4, 9-hour day shifts. One of his partners will take over from 3 p.m. to 7 a.m.
At 7:30 a.m. Dr. McCabe touches base with registered nurses Donna Mann and Carrie Hensel to discuss any special concerns regarding the unit’s 7 inpatients. After reviewing charts, labs and X-rays, a pre-round huddle occurs at 9 a.m. to discuss which patients to see first. This decision is often based on simple courtesies like whose parents need to get to work soon and whose family is still asleep. Throughout the day, Dr. McCabe touches base with registered nurses like Donna Mann to discuss any special concerns regarding the patients. In addition to Dr. McCabe, Carrie and Donna, others are rounding on patients, including: Katie Wilhelm, a medical assistant; Krystal Kohlman, a physician assistant student from Baldwin Wallace University, and 3 nursing students from Kent State University Stark Campus. Teaching residents and students is another part of Dr. McCabe’s job. In other community hospitals, hospitalists often are also in private practice seeing office patients after hospital rounds. That’s not the case for Dr. McCabe and his partners. Today’s caseload starts with 2-month-old Mason who was born premature and spent 4 weeks in Aultman’s neonatal intensive care unit. He was discharged 2 weeks ago and was showing signs of breathing difficulties yesterday in his pediatrician’s office. Krystal Kohlman, a physician assistant student from Baldwin Wallace University, asks him a few questions at the nursing station. Using the family-centered care approach, Dr. McCabe asks Mason’s parents if they think he looks and seems better than yesterday. “Sometimes these babies are fragile and sometimes it’s hard for the parents to see them as anything other than being fragile because of everything they’ve been through,” he said. Dr. McCabe explains that Mason’s nose was pretty clogged and because babies try to breathe almost exclusively through their noses, suctioning his nose has helped tremendously. He suggests the use of a vaporizer at home to help keep the air humidified. 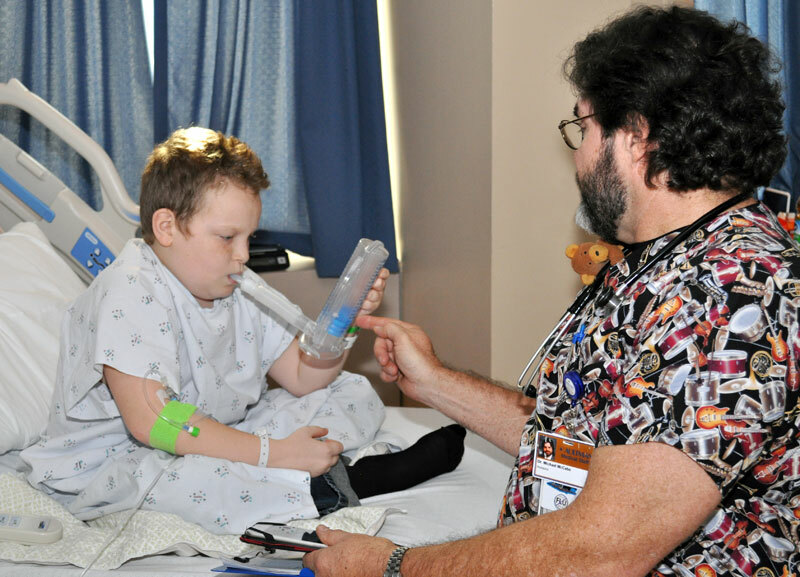 11-year-old Caiden uses an incentive spirometer to help clear his lungs. Sixteen-month-old Leahnee hasn’t been eating much since experiencing coughing, febrile seizures, mucousy stools and a rash that has spread on her trunk. Mom and dad are clearly worried. Dr. McCabe explains that Leahnee’s tests all came back negative for anything serious. He tells mom and dad that the respiratory therapist will be coming in to teach them how to use a spacer and puffer to help with Leahnee’s coughing and wheezing. Cammi, 7, was admitted to the hospital last night to rule out Kawasaki disease. Cammi’s mom explained that she’s had a cold for the last few days and spiked a fever yesterday. She was sent home from school with a noticeable case of pink eye that seems to have worsened since starting eye drops. Each room has a white board to ensure parents understand their child’s treatment plan. This is the plan to attack Caiden’s pneumonia. Dr. McCabe asks mom about the health of everyone else at home. Lab tests show a possible urinary tract infection so Dr. McCabe orders a repeat urine analysis. He presses gently on her belly asking about any pain. When Cammi sits back up he takes a peek in her ears. “Hello, is there anybody in there?” he jokes. He notices that one ear canal is draining pus. Mom states that it wasn’t there earlier. Dr. McCabe explains to mom that a lot of what he’s seeing looks like adenovirus. 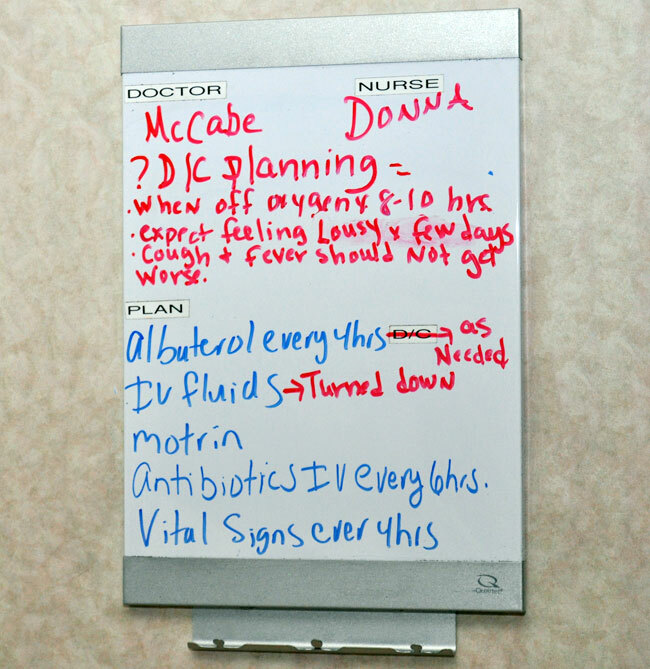 Cammi’s nurse, Carrie, writes down the plan of care on a white board in her room which includes a regular diet, measuring urine input and output, getting a repeat urine culture and stopping eye drops. Dr. McCabe takes a short break from rounding on patients to input orders into the computer. After seeing a 3 year old with croup, Dr. McCabe and Krystal, the student physician assistant, confer over the chest X-ray of 2-month-old Ella who may have a slight case of pneumonia. Ella was admitted through the ER last night. Mom says Ella has been lethargic, feeding less and breathing hard. Upon exam it’s determined that Ella doesn’t appear to have an ear infection although she does have a considerable amount of wax in her ears. Dr. McCabe asks for an ear picker to remove it. He explains the care plan to mom, which includes turning down Ella’s IV to help her appetite and watching her cultures to see if her pneumonia worsens. His last patient on rounds is 11-year-old Caiden who has pneumonia. He was admitted last night for a high fever and low oxygen saturation levels. Nurse Donna rattles off Caiden’s current respiratory vitals. After being on oxygen through the night his saturation levels have improved significantly. Mom lets Dr. McCabe know that Caiden has been sick for a week with a dry cough that has worsened over the past 3 days. Dr. McCabe asks whether he has a history of asthma. Chad, one of the nursing students, has been working with Caiden on using an incentive spirometer to help clear his lungs. Dr. McCabe explains to mom that he likes to observe patients for 8 to 12 hours after coming off oxygen before making a determination on discharge. After completing rounds he spends the next hour typing notes, reviewing orders and following up on lab results. He clears Cammi and Leahnee to go home later in the day and stops back in Caiden’s room to answer some questions he has about the incentive spirometer. 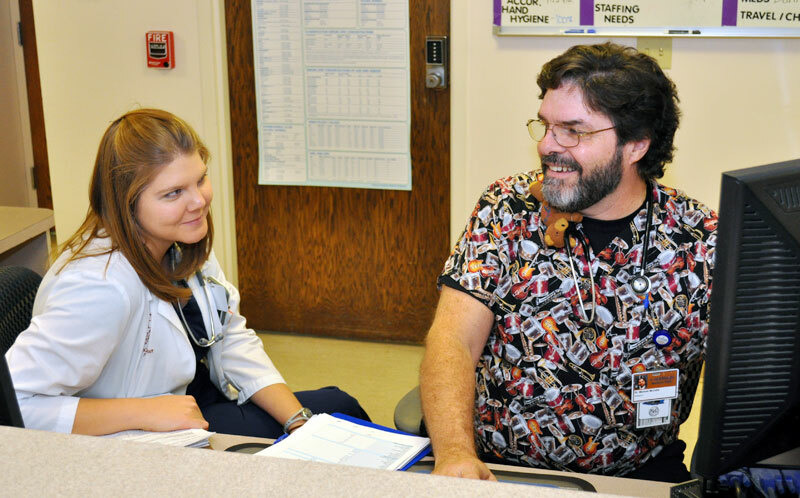 After returning emails about Akron Children’s physician initiatives and discussing them with Dr. Kilkenny during the shift change, he speaks with the charge nurse about pharmacy issues and answers emails about an upcoming event in December. “We try to support hospital and community initiatives,” he said. Dr. McCabe will accompany Aultman’s WOW van (Wellness on Wheels) and its mascot, Freddie the Frog, to a local grade school to accept money raised by the students. Tomorrow he’ll be back at the hospital doing it all over again. Akron Children’s hospitalists also care for children in other inpatient pediatric units including on the Akron campus, Beeghly campus in Boardman, and at Wooster Community Hospital and MedCentral Health System in Mansfield. Kids & Diabetes: What’s True & False?